The trio of Casey Cizikas, Matt Martin and Cal Clutterbuck always goes fourth in the pregame line rushes and their game is marked more by grit and physicality than offensive prowess. 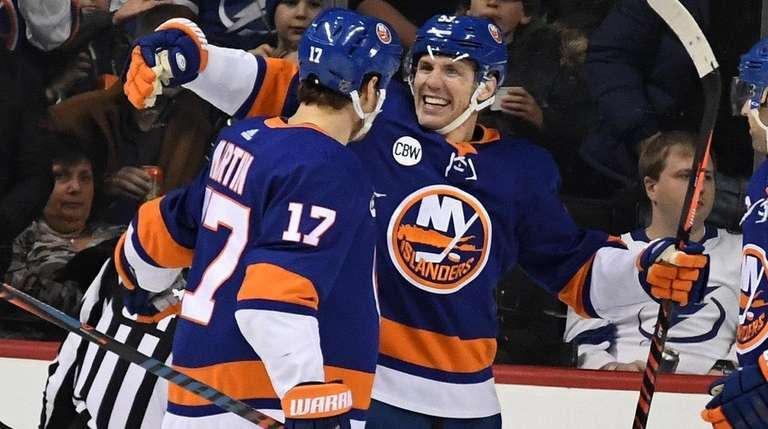 So, in hockey terms, they are the Islanders’ fourth line and, in Martin’s first tenure with the team, were dubbed the best in the NHL. The Islanders, who conclude three straight games at Barclays Center on Tuesday night against the Blues, did not practice on Monday. On Sunday, Cizikas and Clutterbuck each had a goal and an assist and Martin had two primary assists as the Islanders topped the NHL-leading Lightning, 5-1. Trotz has relied on the line’s hard-working nature to set the tone for the team’s identity and has had them on the ice to start seven straight games heading into Tuesday night. That would have been eight straight except Trotz had Leo Komarov temporarily in Clutterbuck’s spot to start a 4-0 win at Toronto on Dec. 29 so the Scotiabank Arena crowd could acknowledge the former Maple Leaf. Overall, Trotz has had Cizikas, Martin and Clutterbuck in his starting lineup 17 times. Cizikas has no problems with his trio being identified as the fourth line. Cizikas also has eight assists. Clutterbuck has three goals and seven assists and Martin, reacquired after two seasons with the Maple Leafs, has five goals and five assists.